I did get my head 'round making a Christmas card, probably helped my the miserable weather. It's for the 'Father Christmas' challenge over at DCM. This week there's a prize from Crafty Emmas Store for one lucky random winner! Still one day left to enter and there's lots of Father Christmas inspirtion from the DT over on the DCM blog. Still using up my old paper stash, this one is Basic Grey Dasher. Gorgeous card Vicky I love it! I love it Vicky. What a fab image! I really love the paper frill etc. Okay, this is such a darling card...love it. All your projects since my last visit are stunning, as always! This is gorgeous - I love the tartan trim and the Father Christmas is fab! Oh I love that Santa image and even better that it was a freebie. A fabulous card as always Vicky and it's great to have you joining in with us at DCM. What a lovely card Vicky, really like the tartan look! 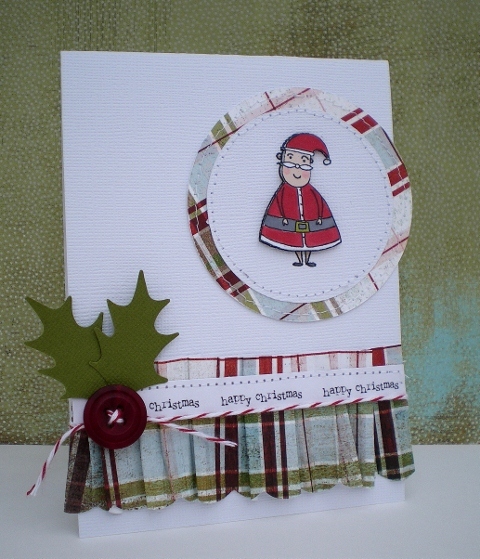 Gorgeous card Vicky, I love the tartan frill! 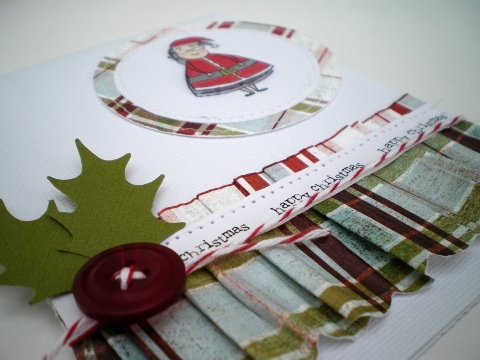 Thanks for sharing with us at The Daring Cardmakers this week! I love this sweet santa and all the tartan! A fabulous card! This is just super, your straight forward elegant style is perfectly displayed with this card.